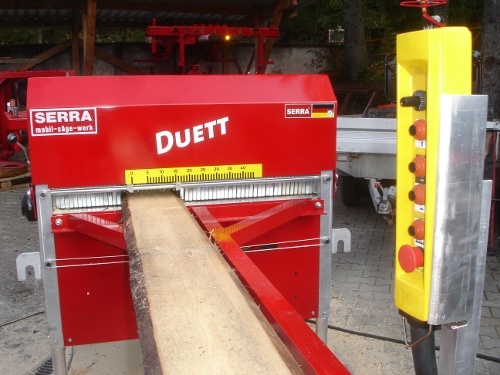 SERRA's horizontal band saw mills allow you to mill logs up to a diameter of 35, 43, 53 or even 63 inches. 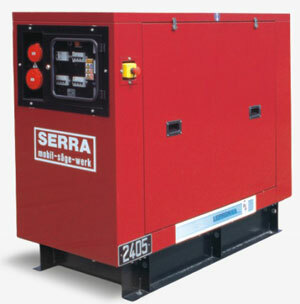 Some saw models have diesel or gasoline engines. But all saws can be electrically powered, either from 3-phase landlines or you can work with a generator. Thin-kerf, wide bandsaw blades in widths from 3-1/4" to 6", variable blade length, operating cost is only 1/10th of that of a narrow blade. Pivoting sawhead can enter the log at an angle, for ease of sawing and greater speed. Use a joystick to move and clamp logs hydraulically, and rotate them with the patented log clamp turner. 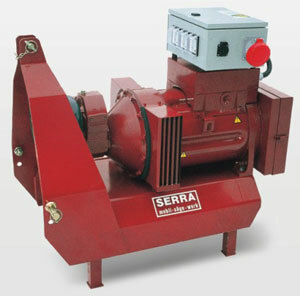 Choose the right size of Serra sawmill for your needs. See products below. Controls are all at one end of the machine. Heated handles for your comfort in winter. No sawdust flying in the wind. Sawdust container empties hydraulically. The debarker rides along in front of the sawblade, minimizing damage to the blade from sand, stones and thick bark. Up to four log loaders with up to 3.5 ton capacity can be mounted. Stainless steel bunks prevent discoloration when cutting red oak and are rounded so bark doesn't get in the way. Squaring arms for right-angle positioning of the log. Roller drums which move the log forward or backward, but also upward to help level tapered logs. Heavy-duty, computer-modeled frames for any weight of logs, specially wide and robust design. Low noise, low vibration electric motors - 400 V, 3-phase. Optional diesel engine for the Montana and gasoline for Alpina. If land line electricity is not available, it can be supplied with diesel generators and PTO generators to run from a tractor.